CD 141.9 EMMINGER'S, Light Green Aqua; an all time classic! 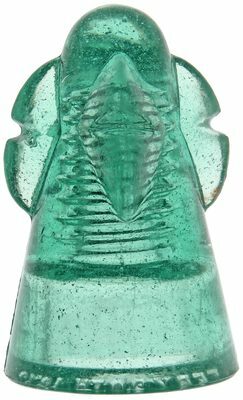 Lot 1: CD 141.9 EMMINGER'S Color: Light Green Aqua Description: When a collector hears the word "Emminger's" their heart starts to race... so we want to provide a good, detailed description of the condition so that the bidders know what to expect. 1/8" ding on the skirt. Thin 3/8" slice at the base of the skirt as can be seen in view 3. One lozenge-shaped projection, as it is referred to in the patent, is slightly chipped as is shown in view 4. Overall, the condition is very good. The "Emminger's" style was used along railroads in two separate parts of Pennsylvania, and has been found primarily in Pennsylvania. One goal of the design was "that dirt and dust are prevented from accumulating upon its outer surface" by constructing the insulator in a conical shape. A second goal was to reduce the point of contact between the conducting wire and the insulator. This was the function of the lozenge-shaped projections. Because of this design, the projections were often damaged. The June 22, 1872 issue of The Telegrapher reported the following: "A telegraph line has recently been completed from Sunbury to Hazelton, PA, along the line of the Danville, Hazelton and Wilkes-Barre Railroad." It went on to say "Emminger's new pattern of glass insulators are used but are found more liable to fracture than the common kind." The "Emminger's" style has a commanding presence that no other insulator can match, towering nearly an inch over your standard CD 154. The January 2007 issue of Crown Jewels of the Wire states "the CD 141.9 Emminger is one of the hobby's most sought after insulators. It has a unique design; a pleasing angelic shape (imagine the projections are wings); and is extremely rare with very few examples known to exist." Since that time, some additional examples have surfaced. We'll set a conservative estimate and the opening bid to $10 and let you have some fun!